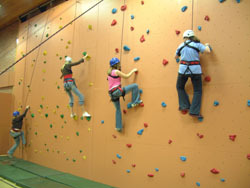 The 'Cliffhangers' have received major sponsorship throughout the past six years and have constructed one of the largest indoor climbing walls within the Air Training Corps. 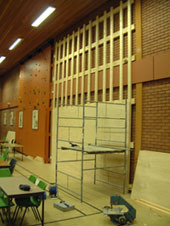 The wall measrues over 60' in length and has already had two extensions. 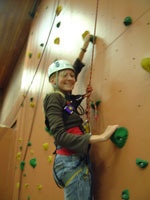 The Squadron has 12 Qualified Instructors on the climbing wall, all of whom hold current First Aid Qualifiactions. 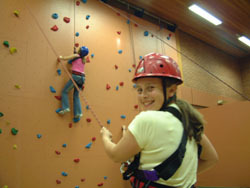 The wall is also certified annually by outside assessors. 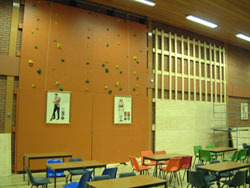 The Chief Instructor, Civilian Instructor Richard Hearn provides climbing activities to suit all, with basic, intermediate and advanced routes located on the wall. 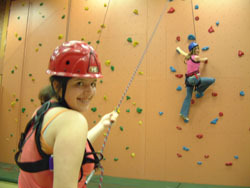 All these routes are changed every month to enhance the Cadet's climbing experience. 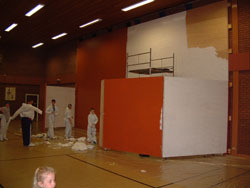 Any Squadron wishing to use this facility should contact OC 215. 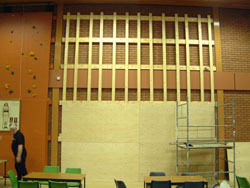 The Construction of the Climbing Wall in 2000 and its extension in 2002. 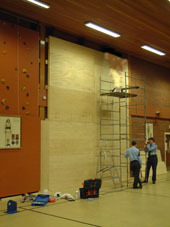 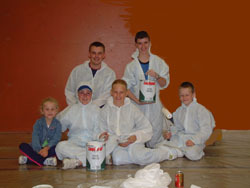 The Cadets and Staff completed two sections of the climbing wall, the first being constructed in 2000 and the second section being constructed in 2002.
of the Royal Air Force Association. 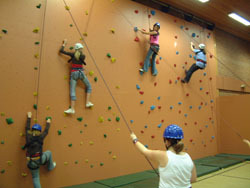 The Climbing Wall is certified every year by an outside body to confirm its safety.